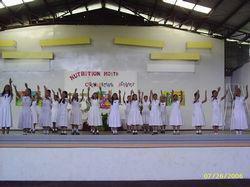 NOTRE DAME OF ESPERANZA INC. - S.B.V.M. One of the foundational principles of the Catholic social teaching tradition is that of “solidarity”. This is generally understood as the establishment of a sense of mutual care among citizens at the social level. Solidarity is primarily considered as a horizontal dynamic, if you will. However, it is perhaps beneficial to conceive of solidarity in another dimension, namely in its transcendent, or vertical, aspect. The cultivation of a genuinely religious imagination is rightly construed as the establishment, in a sense, of solidarity between members of the heavenly community with those of the earthly one. A true “culture of life”, while expressed in the earthly arena, must be informed by and take its cues from strong bonds with God and those who have gained special union with him, the saints. Only in so far as the social bonds are informed by the religious bonds and vice versa, does a reality emerge in which the fullness of the dignity of the human person (both individually and communally) is truly recognized and promoted. It is striking here the directive to be looking at the image of Christ while reciting this prayer daily, thereby establishing the religious imagination as a powerful means to building up friendship with the Lord while allowing that friendship to lead one in the effort to live a virtuous life. Having taken a closer look at one particular sodality, brief reference must be made as to how widespread sodalities were in the earlier in the last century. In 1934, for example, there were 1,143 school-based sodalities in existence and another 8,210 parish-based sodalities functioning throughout the country. In 1957, 205 of these sodalities were of that elite type which was directly associated with the “Prima Primaria” in Rome. Tens of thousands of sodalists were active in every part of the country for much of the last century. To give shape and coherence to this massive movement, the Queen’s Work, a publishing house in St Louis, supplied countless thousands of instruction manuals for prayer and examination of conscience, pamphlets elaborating Catholic teaching on every imaginable social problem of the day, inspirational materials aiding meditation on major liturgical feasts, lives of the saints, etc. Fr. Dan Lord, director of the Queen’s Work for much of the first half of the 20th century, personally authored over 220 of these pamphlets for a total of some 20,000,000 copies distributed to sodalists throughout the country. He also established what were known as summer schools of Catholic action in various parts of the country in the summer months to provide a more intensive religious formation for sodalists while cultivating strong bonds of friendship of youth who would otherwise never have met one another. Today, there have been 10 visitors (14 hits) on this page!